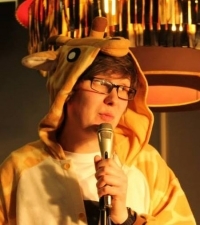 Micky has been performing stand up on the open mic circuit across the South West for the last three years. His material is mostly personal but can cover topics as far ranging as Van Gogh and Plato. He is also a founding member of Bristol based improv group Basement Acts and regular compere of Yardshtick Comedy.